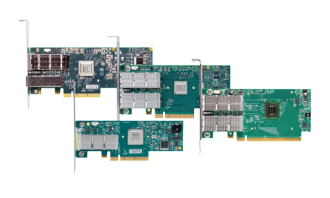 Mellanox InfiniBand Host Channel Adapters (HCAs) provide the highest performing interconnect solution for Enterprise Data Centers, Web 2.0, Cloud Computing, High-Performance Computing, and embedded environments. Clustered data bases, parallelized applications, transactional services and high-performance embedded I/O applications will achieve significant performance improvements resulting in reduced completion time and lower cost per operation. 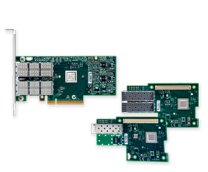 Intelligent ConnectX-5 adapter cards, the newest additions to the Mellanox Smart Interconnect suite and supporting Co-Design and In-Network Compute, introduce new acceleration engines. Supporting EDR 100Gb/s InfiniBand and 100Gb/s Ethernet connectivity, provide the highest performance and most flexible solution. 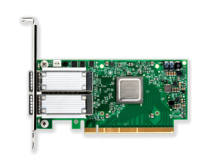 Connect-IB adapter cards provide the highest performing and most scalable interconnect solution for server and storage systems. 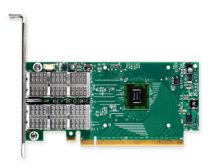 ConnectX-3 Pro adapter cards with Virtual Protocol Interconnect (VPI), supporting InfiniBand and Ethernet connectivity with hardware offload engines to Overlay Networks (“Tunneling”). 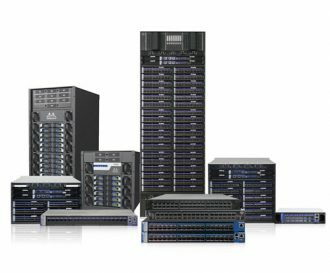 Mellanox’s family of InfiniBand switches deliver the highest performance and port density with complete fabric management solutions to enable compute clusters and converged data centers to operate at any scale while reducing operational costs and infrastructure complexity. 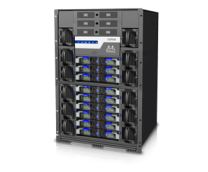 Highest performing fabric solution by delivering high bandwidth and low-latency to Enterprise Data Centers and High-Performance Computing environments in a 12U chassis. 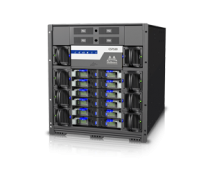 Delivering high bandwidth and low-latency to Enterprise Data Centers and High-Performance Computing environments in a 16U chassis. 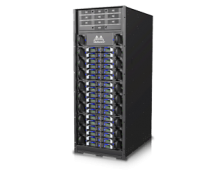 The highest performing fabric solution by delivering high bandwidth and low-latency to Enterprise Data Centers and High-Performance Computing environments in a 28U chassis. 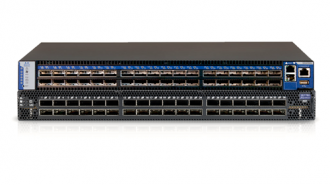 Mellanox’s InfiniBand to Ethernet gateway functionality built-in within Mellanox switches provides the most cost-effective, high-performance solution for data center unified connectivity solutions. Mellanox’s gateways enable data centers to operate at up to 56Gb/s network speeds while seamlessly connecting to 1, 10 and 40 Gigabit Ethernet networks. Existing LAN infrastructures and management practices can be preserved, easing deployment and providing significant return-on-investment. High-performance, low-latency 56Gb/s FDR InfiniBand to 40Gb/s Ethernet gateway built with Mellanox’s 6th generation SwitchX®-2 InfiniBand switch device. A fully flexible 36 EDR 100Gb/s ports, which can be split among six different subnets. 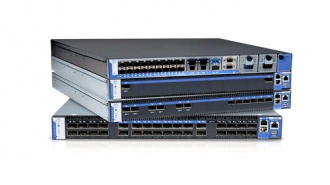 BridgeX is the first VPI (Virtual Protocol Interconnect) gateway allowing the OEMs to design I/O consolidation solutions using InfiniBand or Ethernet as the convergence fabric of choice. A unified server I/O, where multiple traffic types can run over a single physical connection can help cut I/O cost and power significantly while reducing total cost of ownership through reduced number of ports to manage, reduced cabling complexity and simpler fabric management. At the same time, connectivity to IP/Ethernet based LAN and NAS infrastructures, and Fibre Channel based SAN infrastructures must remain seamless. Supports 2 long-haul ports running 40Gb/s to a distance up to 40km. 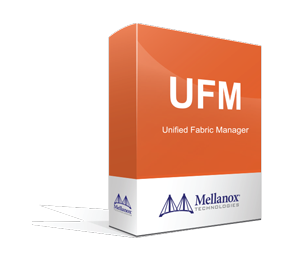 Mellanox’s Unified Fabric Manager (UFM®)is a powerful platform for managing scale-out computing environments. UFM enables data center operators to monitor, efficiently provision, and operate the modern data center fabric. UFM eliminates the complexity of fabric management, provides deep visibility into traffic and optimizes fabric performance. Contact XENON for more information.